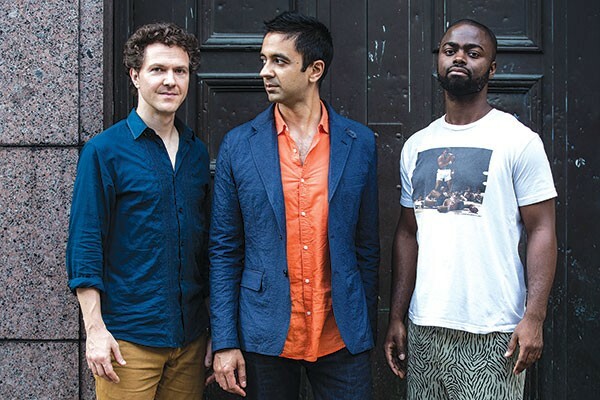 When the Vijay Iyer Trio performed at the Detroit Jazz Festival a few years ago, something about the music became apparent to this writer’s ears. The band was floating along, playing a two-chord vamp. But it wasn’t a get-the-audience-groovin’ kind of vamp. Nor was the trio spinning its collective wheels while figuring out where to go next. They were toying with the groove, making it sound slightly out of sync. Bassist Stephan Crump straddled his rhythmic role with a harmonic one. On drums, Marcus Gilmore seemed to stretch time even as he held it together. Iyer didn’t need to unleash a complex melody to lift the energy. The trio was already lifting it together. This uninhibited approach is one of the reasons that Iyer’s trio is among the country’s most engaging acts in modern jazz, and the recent recipient of Jazz Artist and Jazz Group of the Year in downbeat magazine’s Critic’s Poll. 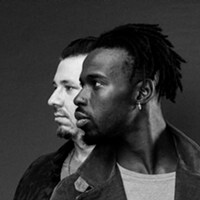 The fact that Pittsburgh is getting a visit from the trio for City of Asylum’s annual Jazz Poetry Concert — a free show, no less — ranks as a major event. Among the dozen tracks on Break Stuff, Iyer also pays tribute to three masters: Thelonious Monk, John Coltrane and Pittsburgh native Billy Strayhorn. Whether it’s the playful melody of Monk’s “Work,” revamping ’Trane’s “Countdown” (a simple theme that birthed one of the saxophonist’s most complex solos), or Strayhorn’s emotional “Bloodcount,” the music pays tribute while it also pays it forward. Iyer’s skill at bringing new elements to the table has resulted in myriad projects and support for them. He holds a professorship at Harvard University, with an artist-in-residence post beginning next year at the Metropolitan Museum of Art. All this is in addition to receiving a fellowship from the MacArthur Foundation in 2013 (often called the “genius grant”), which awards a stipend of $625,000, paid out over five years. Prior to the trio’s most recent album, Iyer debuted on the long-standing jazz label ECM with Mutations, a series of original pieces where he played piano and electronics in tandem with a string quartet. While not exactly jazz, it was marked by the same exploratory nature as his work with the trio. 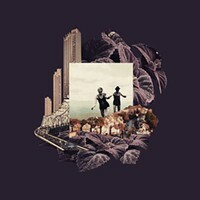 The results sometimes sounded like contemporary new music, while at other times evoking the more ambient collaborations of David Bowie and Brian Eno. For the Jazz Poetry Concert, the trio will perform a set, and Iyer will also collaborate with saxophonist Oliver Lake — who organized the program — together with the poets Terrance Hayes, Heather McHugh and Harris Khalique. The pairing of poets and Iyer’s music has been well documented through his collaborations with wordsmith Mike Ladd. Of their politically charged works, the most intense and moving was 2013’s Holding It Down: The Veterans’ Dreams Project, which featured minority veterans of the Iraq and Afghanistan wars telling their stories over music. Iyer refers to Lake, who is perhaps best known as a member of the World Saxophone Quartet, as a “longtime hero and friend of mine.” The pianist collaborated with his group Trio 3 last year on Wiring, where Iyer contributed the extended “Suite for Trayvon (And Thousands More): Fallacies.” His skill at controversial topics and rendering them with intensity and grace make him a natural for City of Asylum, an organization that shelters and supports exiled poets and writers.